I cannot even begin to tell you how important it is that you select the proper boat for cruising. This may be the single most significant decision of your entire life. It’s more important than selecting a college major, more difficult than finding your life mate, and presents you with more diversity of choice than the beverage options at Starbuck’s. And your very life depends on your selection. Let me repeat that with a virtual, concussive reverberation machine: Your very life depends on your selection…selection…selection…. There are Rules on how to do this. The Rules in this case consist of the long list of salty sailor instructions regarding the fine art of boat selection. There are literally hundreds of helpful articles and even entire books devoted to the subject of selecting your perfect cruising boat. Among the considerations you should apparently noodle are items such as seaworthiness, speed, performance, availability of parts, hull material, rigging configuration, and construction quality. Depending on which multi-bazillion-mile sailor you read, you should either purchase the largest, roomiest most comfortable boat you can afford, or you should purchase the smallest, most cost effective boat you can stand. Most agree you should start with a smaller boat, learn how to sail, and get your feet wet – as it were – before you consider the purchase of your cruising boat. 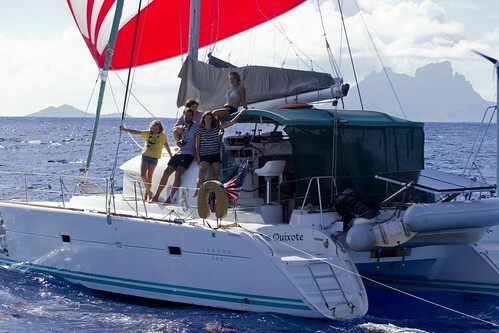 When you find a boat style you think will do, you charter a sister ship and go on test sails. See if you can spend a week aboard a boat of a similar size and conformation. Talk to people who own these boats. Get on their Yahoo mailing list and read the entire archive back to the founding of the American colonies. Then locate your first candidate boat. Go on a sea trial and have an extensive survey. Insist on seeing the logs since the hull was laid. Open every thru hull and rummage through all the lockers. Tap on every square inch of the fiberglass to find bubbles and haul the boat to check every bit of the bottom for blistering. THEN… then and only then should you consider buying your cruising boat. It happened like this. Skip the reason why for another article and get to the sailing experience. Dr C sailed with his father in circles on the family’s Valiant 42 out of Newport Beach as a teen and pretty much loathed the futility of circular travel itineraries and bashing around at a 25-degree angle off the Pacific coast. My entire nautical experience consisted of seven days on a sail boat in the San Juan Islands, three days on the Disney Cruise Ship, and an inebriated summer in high school spent tubing the American River. When it came time to buy a boat, he wanted a multi-hull, probably because it was about as far from his dad’s deep-keeled sea worthy gem as possible. I wanted something with enough room to avoid my children. The kids wanted a slide. Five minutes, tops, to select the category Cruising Catamaran. Moving on, once you decide on a multi-hull two things happen. First, the number of tips offered by salty sailors drops from a million to one: “Don’t do it. Catamarans are not as safe as monohulls.” It’s a relief, really, because once the support network of experienced sailors starts to turn negative on you, it’s easy to dismiss nearly everything else they recommend. The second thing that happens is that the number of boats available to you goes from one million to one – especially if you live on the Pacific west coast and don’t want to have a boat shipped all the way from Europe or South Africa. The total number of used catamarans on the market out here at any given time varies between three and fifteen. You think I’m joking? Go check out Yacht World. Note: Yacht World is to wannabe cruisers as the Liquor Barn is to an alcoholic. Follow this link at your own risk. We browsed around and looked at lots of pretty pictures of catamarans, took a Fountain Pajout out for a day sail, ogled a Lagoon 410 on the dock, and then bought sight unseen the first Lagoon 380 that came on the market in the Pacific Northwest… pending sea trial and survey yadda yadda yadda. Whatever. But don’t let this experience mislead you! Do as I say, not as I do! Because if you run off and buy the boat without proper preparation and evaluation you might end up like us. You, too, could be living happily on a gorgeous, well founded cruising sailboat bobbing at a dock in Elliott Bay watching the sunset glint off the Seattle skyline while sipping mai tais. A fate worse than …um… I’m drawing a blank here. Yacht World is indeed a good source of information if you want to deal exclusively with salespeople during your research. However, if you would like to use a reputable editorial source for researching charters, you should visit www.CharterWave.com. It's an online magazine, not an online charter sales agency, so you can ask questions and read articles without any pressure to buy anything at all. 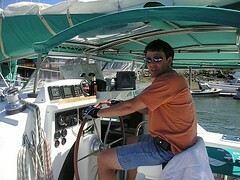 Yacht World is indeed a good source if you want to deal exclusively with a salesman when looking for yachts to charter. 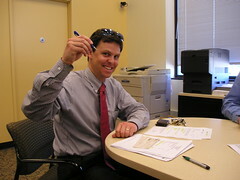 However, if you want to do your research without pressure to buy anything, you should check out www.CharterWave.com. CharterWave is an online magazine that covers charter yachts, brokers, crew and destinations worldwide. You can do your research without having to give your contact information or worry about being pressured to buy anything at all. Yes, Yacht world is like crack to an addict. We have already purchased a boat, but find ourselves browsing YW frequently, ohh'ing and ahhh'ing at the boats.